Mode Junkie: SUMMER WITH O'NEILL & FASHIOLISTA. hello from super sunny philippines! i have been complaining about this friggin weather since god knows how long and it did not just magically change after that. 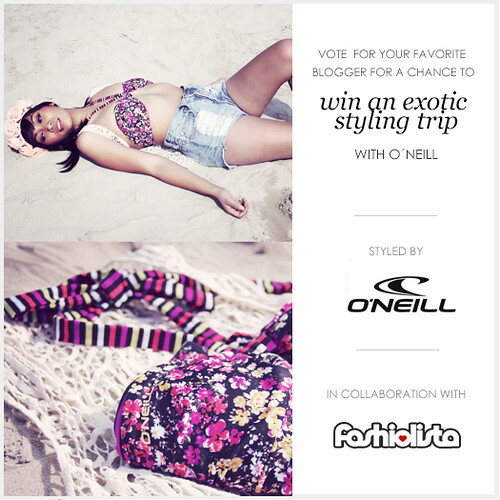 sometime last week, we braved the cold to shoot these pictures for a fun contest over at Fashiolista with O'neill. OKAY, i know that i am not skinny. never was, never will be. i love me my burgers, steak and cakes so much. so why show you these pictures, right? because, i might be able to bring one of you guys (who votes for my look) to one exotic country (i heard they´re choosing between Brazil, Hawaii or Santa Cruz) for a styling trip with O'neill next summer! you want to hear a funny story? i haven´t owned a bikini up until i was 20. we swam with our shirts & shorts on in the philippines. so it is still weird for me to go full two piece even in my "thinner" days. long story short, if you´re up for it, i would love to spend next summer with you! vote for me HERE, would really appreciate it! very nice bikini babe !!! GORGEOUS ! need to sayyy more? that´s so sweet of you babe! THANK YOU! love getting comments from my silent readers!! That's a super cool bikini! Lovely print. And great pictures! So pretty ♥ Floral headbands are so nice!!! Gorgeous look! I love the bikini!!! Participated and now hoping to win, yay! Love yr blog and yr style! Amazing shots, girl and u look awesome! My fave is yr shorts in this look! Love this post dear, the shorts are amazing!! beautiful photos too!! "we swam with our shirts & shorts on in the philippines"
yes this is funny, cause we Filipinos really is a conservative type, but not so much nowadays. A lot has change, but not me, i still feel awkward and shy to use my 2 piece bikini, i still pair my top with shorts.